Pandanus Lá Dua leaves produce a healthy & invigorating anti-oxidant herbal tea helpful in rejuvenating and nourishing the body. The tea has a cooling effect which helps to maintain the heart and liver in good condition and helps relieve fever and soothe sore throats. It is also good for the treatment of internal inflammations, urinary infections, colds, coughs, measles, bleeding gums and skin diseases. In folklore, a decoction of the tips of fresh or dried prop roots is used as a diuretic. Poultices of fresh leaves mixed with oil are used for headaches, while pulverized dried leaves are used to facilitate wound healing and its oil is considered a stimulant, antispasmodic and antiseptic. The Lá Dua leaves contain essential oils, alkaloids, glycosides and tannin. It is also used in traditional aromatic bath & spa soaps that produce a unique fragrant scent. La Dua is said to be a restorative, deodorant, indolent and phylactic (serving to protect especially against disease), promoting a feeling of wellbeing, and acting as a counter to tropical lassitude (debility, fatigue, or diminished energy). It's also a breath sweetener and an effective organic food preservative. Another interesting and useful attribute to this herb is that roaches tend to dislike the compounds of La Dua leaves. In Asia, leaves can be distributed as a safe organic natural repellant to rid roaches by sprinkling La Dua leaves in infested areas. Mid-eastern Indians use the flower of this plant in making perfume, while in Thailand, the leaves are often used as flavorful wrappers for morsels of food, as the leaves will leave their aroma in the food � though the leaves themselves are too tough for eating. as Nasi lemak, Kaya preserves, and desserts such as sweet cake. For festive holidays and ceremonies, La Dua is used with the essences of rose to flavor spicy rice dishes such as Biryani. La Dua leaf is used in flavoring sweet desserts and rice dishes in Indochina Asian cuisines. The best candidate is 2-acetyl-1-pyrroline (2AP), which was found in the leaves at levels of about 1ppm and which also occurs in aromatic rice cultivars such as Basmati & Thai Jasmine; another possibility is ethyl formiate, which is also common to both rice and La Dua leaves. In ancient times, the leaves were used for making thatched huts and women�s grass skirts. Strips of the leaves are used in making woven baskets throughout Indo-china used to serve rice or other food items. The botanical provides materials for housing, clothing and textiles, food, medication, decorations, fishing, religious uses and the manufacture of handbags & mats, hand woven from the dried leaves. 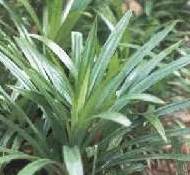 The Lá Dua botanical offers a pleasant scent widely used in Indochina (southeast Asia; Vietnam, Laos, Cambodia, Thailand, Myanmar (Burma), and the mainland territory of Malaysia) to give flavour to sweet rice and other desert dishes. Before cooking, just add a few leaves to your steamed rice and the rice will become even more fragrant than Basmati orJasmine rice! In Thai gai hor bai toey cuisine leaves are used as fragrant wrappers. Pandanus Láa Dua chicken, gai hor bai toey, is a classical recipe and an eternal favorite in restaurants: Marinated chicken bits are wrapped in leaves and deep-fried in a wok. Although the leaves are too hard to eat, they impart a most exotic aroma to the meat. All over South East Asia, Pandan La Dua leaves find their most important culinary application in desserts: In Thailand, iced drinks from young coconuts with Là Dua flavor are very popular, and in Indonesia, the leaves are made into ice cream like concoctions (Espandan, see also vanilla on the topic of ice creams). Furthermore, Lá Dua leaves appear more frequently in sweet puddings or custards based on "sticky" (glutinous) rice. For these concoctions, glutinous rice is boiled with water, palm sugar and Lá Dua leaves to yield a heavy mass that becomes semi-solid on cooling. Before serving, thick coconut milk is sprinkled over it. It is often possible to substitute Lá Dua by vanilla or nutty flavors (e.g., hazelnut extract) in these recipes, although the flavours are not too similar. The flavor component of leaves is not well known. It is speculated that the flavor is a volatile product of oxidative degradation of a yellow carotenoid pigment that forms only when the plant withers. In that respect, there are similarities to saffron and rose, which also contain carotenoid-derived aroma compounds. The best aromatic candidate is 2-acetyl-1-pyrroline (2AP), which was found in P. amaryllifolius Roxb leaves at levels of about 1 ppm (Cereal Chemistry, 70, 381, 1993 and which also occurs in aromatic rice cultivars; another possibility is ethyl formiate, which is also common to both rice and Lá Dua leaves (Naturwissenschaften, 71, 215, 1984). On distillation, the leaves do yield traces of an essential oil, but it is unclear to which extent the volatile oil contributes to the flavor. Other than its flower yielding relatives, Pandanus LáDua is not known in the wild state. Today, it is distributed over Southern India peninsular, Indochina, Indonesia, and Western New Guinea. The family Pandanaceae comprises approximately 600 species that are widely distributed in tropical and subtropical regions. Thirty-six species have been recorded in India, among which P. odoratissimus Linn. and P. amaryllifolius Roxb. are being exploited commercially. In p.odoratissimus, the flowers are scented, while in p. amaryllifolius & p.latifolius the leaves are scented. Male flowers are extremely rare, and there is no scientific description of a female flower for this species. The only known instances of flowering plants occurred on the Moluccas archipelago, and it is plausible that the species evolved there. The species is, however, unlikely to have evolved from hybridization, as is shares its chromosome number (2n=60) with most other representatives of the genus. It is also interesting to note that Indochina Amaryllifolius is the only species with fragrant leaves. Taken together, the combined lack of a wild population and the large distribution imply a long tradition of cultivation. donuts, just give me a handful of Xoi Dua La Dua with a cup of coffee and I am all set for the morning".(D. Truong from My Tho, Vietnam).